A sumptuously colourful garden has the extraordinary power to lift the spirits no matter the time of year. Yet many people struggle to create their own colour combinations that are suitable to site and soil, and which take their gardens through the seasons. This new book provides inspiration and practical advice for gardeners wishing to improve their plantings, both in appearance and in use. Val Bourne shows how varied and vibrant plantings can enhance the look of beds and borders, and how - with a little planning - they can be beautiful features for much longer than one season. Colour in the Garden is par ticularly useful for those with small gardens, where every inch of space must work hard for as long as possible. 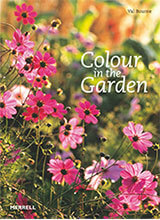 Written by a true plantswoman and experienced gardener, with an in-depth knowledge of plants and how they behave, as well as a strong and creative sense of colour, this guide will revolutionize the way we think about colour in our gardens and ensure that no gardener will ever feel at a loss again.